The first phase of the Nurture with Provimi™ Calf and Heifer Programme is one of the most critical because every newborn calf is very vulnerable to infections. Calves are born without antibodies, as there is no transmission across the placenta. Newborn calves rely entirely on their passive immunity that they get through maternal colostrum. Colostrum contains immunoglobulins, the most important being IgG, that protect the calf against infection and diseases. The estimated birth weight for Holstein calves is around 6.25% of Mature Body Weight (MBW). So, for a Holstein cow weighing 650kg, the newborn calf will should around 40.6kg. To achieve high standards of pre-weaning weight gain, it is important to focus on colostrum management is key as well as hygiene, housing and feeding management. Colostrum is the first milk from a cow that has just calved. It contains high levels of quality nutrients like fat and protein. It also delivers essential antibodies to the calf. Calves are born without fully developed immune systems so the antibodies provided through the colostrum are essential in fighting off pathogens. Use the colostrum of the first milking as the quality is higher and it contains more antibodies. Feed colostrum during the first three days of life. Start the first feed as soon as possible after birth. Feed 2 to 3 litres per feeding time, taking into account the capacity of the abomasum. Feed colostrum in days two and three as it has a high immunological and nutritional value. What is good quality colostrum? Fresh and first milked colostrum, because it contains more antibodies and has a higher nutritional value. Adequate amount of antibodies, at least 50g IgG per litre. 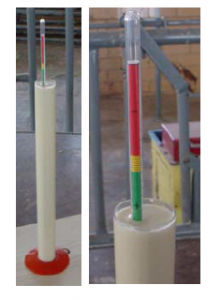 Colostrum from multiparous cows is often of better quality, containing more IgG’s. Feed colostrum around body temperature, around 38-40°C. Store colostrum within 1 hour after collection. Colostrum can be stored in the fridge for a couple of days or in the freezer for about one year. Colostrum from the freezer is best thawed in a warm water bath with a maximum temperature of 50 °C. At temperatures above 55 to 60 °C, proteins will denature. The most important quality factor in colostrum is the amount of IgG. A young calf needs a plasma IgG level of approximately 10 to 15 g/l, and that means colostrum should contain between 50 and 100 g IgG/l. Place two drops of distilled water on the radical of the refractometer and use the calibration screw to set the scale in the refractometer to zero. Remove the water. 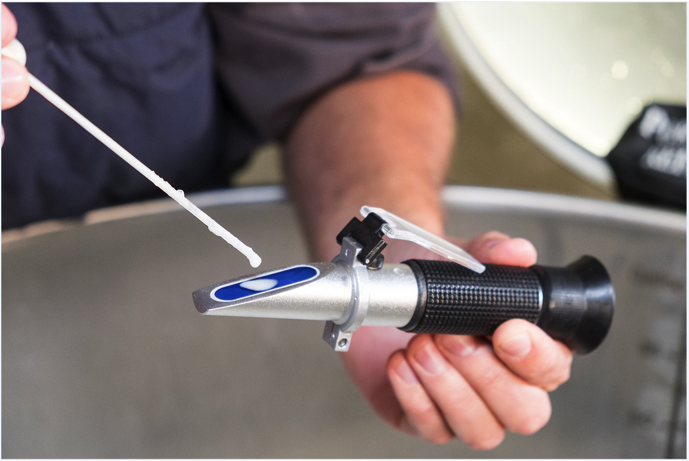 Place two drops of colostrum on the radical of the refractometer. Look into the light and measure the IgG concentration using the Brix scale on the refractometer. A Brix reading greater than 21% indicates that the colostrum has sufficient IgG, so greater than 50g/l. 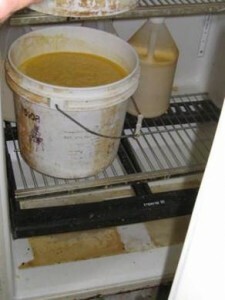 Spare colostrum can be stored in the fridge for a few days or frozen for about a year. It should be stored in the fridge or freezer within one hour after collection, and collected and stored in a clean bucket/container. Colostrum from sick cows or cows with mastitis should not be fed. Colostrum from the freezer is best thawed in a warm water bath with a maximum temperature of 50°C. Temperature above 55-60 °C will denature the proteins. Colostrum shouldn’t be left to thaw at room temperature as it takes too long and gives the bacteria time to develop. 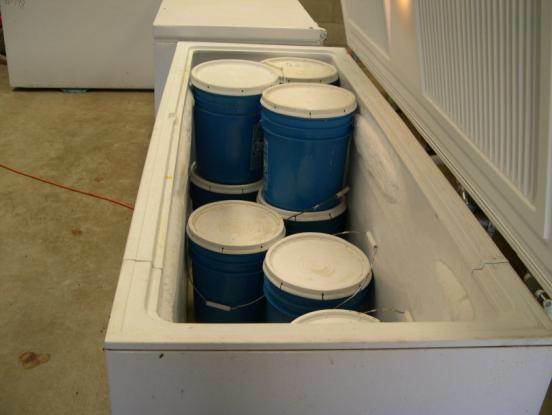 Storing colostrum in the freezer is best done quickly, in small buckets or zip lock bags, which defrost quicker, preventing bacterial growth.